White Water rafting is one admired activity that is being done by most people across the world, Uganda happens to be blessed with river Nile(4,258 miles) which is the second longest river in the world after the Amazon river(4,345 miles) and the first in Africa followed by Congo river(2,920 miles) which happens to be the sixth in the whole world. 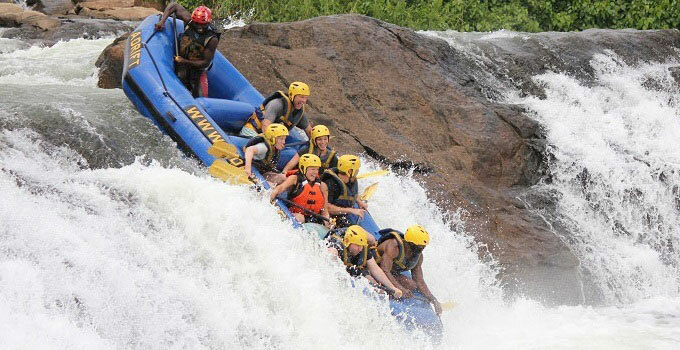 The White Water Rafting Safaris in Uganda are being conducted from Jinja the home to the source of the Nile plus its amazing rapid falls which support the rafting activities a long the Nile. The White Water Rafting in Uganda tour begins with a departure to Jinja 70km from the Kampala city Uganda’s capital city to the point of rendezvous where you have a briefing, a light breakfast and your fitting gear, thereafter get on to the trucks to the point on the river where the real action begins. Jinja is a city next to Kampala as you drive to the eastern parts of the country it’s 70 km (44 miles) a way from Kampala city a distance that can be covered with in 53 min while traveling at an average speed of 80km/h. River Nile provides a spectacular backdrop to a very exciting adventures which includes Rafting in Uganda, though rafting started from Bujagali falls back in 1996, these falls happen to be world class rapids and the safest with the most thrilling grade five rapids. While in jinja for rafting you stand a chance of having great sights of the amazing bird species being habituated a long the side the river and most rafting activities in Uganda end up with visits to the source of the Nile and to Itanda falls which is 30km from the Owen falls dam.